Mahindra Marazzo vs Mahindra TUV300 Plus: Variants Compared. Mahindra launched the Marazzo MPV on 3 September, 2018 at Rs 9.99 lakh (ex-showroom Delhi). Although it’s positioned as a premium MPV, its lower variants overlap with the higher variants of Mahindra’s other UV, the TUV300 Plus. So let’s check out which one suits your needs the best by comparing their variants. But before we delve into more details on their features, let’s take a look at their dimensions and powerplant. 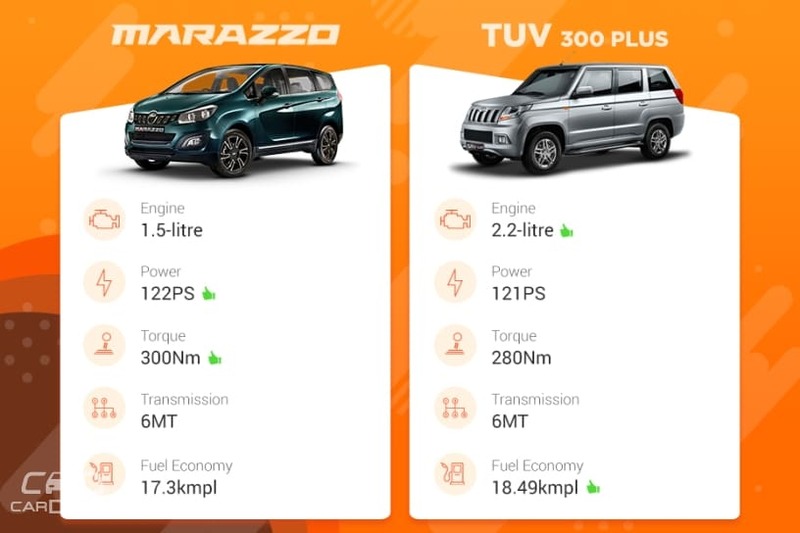 Given their price tags, the bottom two variants of the Marazzo are comparable with the top two variants of the TUV300 Plus. Common Features: Tilt-adjustable steering, mobile charging point in first and second row, manual AC, front and rear power windows, dual front airbags, seatbelt reminder, speed-sensing auto door lock, ABS with EBD and brake assist, and ECO driving mode. What the Marazzo gets over the TUV300 Plus: Electronic power steering (compared to the old-school hydraulic unit in the TUV300 Plus), dual-barrel headlamps, second-row captain seats, manual roof-mounted air conditioning for the second and third rows, front and rear armrests, all four disc brakes, Isofix child seat anchors and speed alert system (three acoustic warnings over 80kmph). Despite being a bit expensive than the TUV300 Plus, the Mahindra Marazzo gets our vote for the goodies and all important safety features it packs. Being a 9-seater, the TUV300 Plus surprisingly misses out on rear air con vents for the second and third row. What the Marazzo gets over the TUV300 Plus: Electronic power steering (compared to the old-school hydraulic unit in the TUV300 Plus), dual-barrel headlamps, second-row captain seats, manual roof mounted air conditioning for the second and third rows, front and rear armrests, all four disc brakes, Isofix child seat anchors, and speed alert system (three acoustic warnings over 80kmph). What the TUV300 Plus gets over the Marazzo: Follow-me home headlamps, front fog lamps, alloy wheels, steering-mounted controls, 7-inch touchscreen infotainment system with navigation, rear parking sensors, two additional tweeters, illuminated glove box, remote lock and keyless entry. While the similarly priced TUV300 Plus is better equipped, the Marazzo is still ahead of the game purely for the better seats, the separate air conditioning unit for second and third-row passengers and extra safety features it offers. Moreover, most of the additional goodies that the TUV300 Plus packs over the Marazzo can be had as aftermarket fitments from Mahindra’s dealers or other third party options.